This post is dedicated to all those who have been waiting for something to finish or to begin, for a problem to solve or simply for the rain to stop. 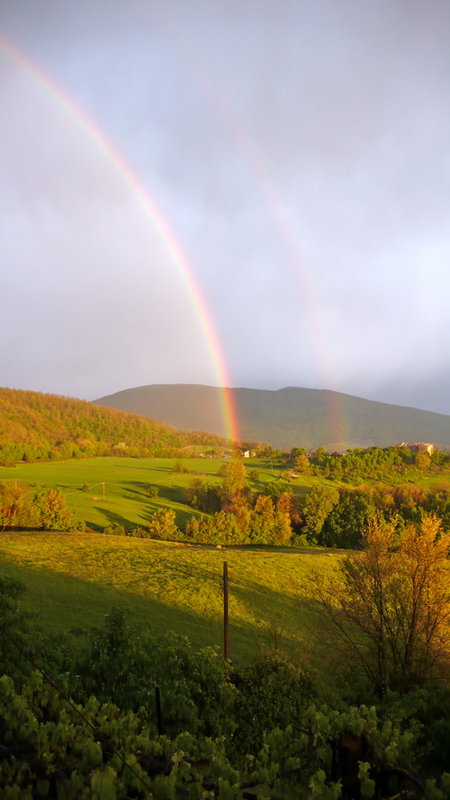 two rainbows from my window, double joy. The “Gerusalemme liberata” is an extraordinary XVI century piece of poetry by Torquato Tasso. The theme is fairly embarrassing by now, it’s about Crusades. It is however strongly symbolic of the collected efforts of men to walk steadily towards a goal. Then, when all seems lost, finally they see it in the golden light of the sun and rejoice. When I am happy, when something really works out, I chant these verses in my head and I know it’s a special day. For willing minds make heaviest burdens light. With joyful shouts, and acclamations sweet. Stunning photo, Letizia, and a beautiful sentiment. I can certainly relate!